If stores are still stocked and safe to go to, try to buy as many of the following items as possible… IMMEDIATELY! There are no quantities listed here on the food items below as family size because, as the emergency and panic widens, many items will be quickly sold-out or quantities restricted, and you’ll need to try to get more of what does remain on the shelves. At a minimum, you should be looking at two weeks of provisions, but much better to be aiming for two months or more. The reality is, if/when we are attacked, it will be a very long time before anything is ever ‘normal’ again, especially at any grocery stores. Hurricane victims can attest to the prolonged misery and disruptions from such a localized disaster, even with the rest of the country still able to help out. Nobody can begin to imagine how bad the suffering will be, and for how long, if nuclear weapons have gone off… and in multiple locations! The half-dozen top listed and UNDERLINED food items listed below are primarily for use while in the shelter. They are mostly ready-to-eat that requires no cooking or preparation, just a can opener at the most. (The iodine solution is included here because of its importance for its thyroid-blocking topical use detailed above, IF you do not have KI pills, but it’s NEVER to be ingested or swallowed.) The other foods listed below there are better cost/nutrition staples for later use during the extended recovery period. Then follows general non-food supplies, tools and equipment. Go Acquire It All Now, QUICKLY! › Plenty of potent Multi-Vitamins, Vit C, Pepto Bismol, other meds, etc. › Iodine solution, like Betadine (16 ounces)- NOT TO BE INGESTED OR SWALLOWED! › Toilet paper and, if needed, sanitary napkins, diapers, etc. › Aspirin/Tylenol/Motrin, Pepto Bismol, etc. › Water filters and all other camping type supplies, such as portable camp toilet, cook stove and fuel, ammo, etc., if any sporting goods stocks still available. › And, of course, rolls of plastic sheeting, duct tape, staple guns, staples, etc. C. What’s the Difference Between Alpha, Beta and Gamma Radiation? 1. Alpha: These are actual particles that are electrically charged and are commonly referred to as alpha particles. Alpha particles are the least penetrating of the three primary forms of radiation, as they cannot travel more than four to seven inches in air and a single sheet of paper or the outermost layer of dead skin that covers the body will stop them. However, if alpha particle emitting radioactive material is inhaled or ingested, they can be a very damaging source of radiation with their short-range being concentrated internally in a very localized area. (Alpha-these waves are easily stopped by normal clothing). D. How Much Radiation Is Too Much? _1. Table: Effects of radiation poisoning based on the millisievert mSv/hr dosage rates, the standard international measurement for absorbed radiation. _2. Table of expected health effects (below) for an adult assuming the cumulative total radiation (rads) exposure was all received within a week’s time. A rad (Radiation Absorbed Dose) measures the amount of radiation energy transferred to some mass of material, typically the human body. One roentgen (R) of gamma radiation exposure results in about one rad of absorbed dose; measurement used in USA in the 20th Century. Tables were prepared for measurements in RAD and R, I’ve pasted them together below; note that they are overlapping, the break down gives you a better idea of what medical consequences to expect at different exposure artes. Bottom Line: Cutting through the above confusion, for purposes of practical radiation protection in humans, most experts agree (including FEMA Emergency Management Institute) that Roentgen, Rad and Rem can all be considered equivalent. The exposure rates you’ll usually see will be expressed simply in terms of roentgen (R) or milliroentgen (mR). 0-50 rads No obvious short-term effects. 80-120 rads You have a 10% chance of vomiting and experiencing nausia for a few days. personnel. Potential for delayed traumatic and surgical wound healing, minimal clinical effect. Moderate drop in lymphocycte, platelet, and granulocyte counts. Increased susceptibility to opportunistic pathogens. Full recovery expected. 130 -170 rads You have a 25% chance of vomiting and contracting other symptoms. 180-220 rads You have a 50% chance of vomiting and having other severe physical effects. 270-330 rads 20% chance of death in 6 weeks, or you will recover in a few months. 300 to 530 R From 2 hours to three days: transient to moderate nausea and vomiting in 50 to 90 percent; mild to moderate fatigability in 50 to 90 percent of personnel. At 2 to 5 weeks: medical care required for 10 to 80%. At low end of range, less than 10% deaths; at high end, death may occur for more than 50%. Anticipated medical problems include frequent diarrheal stools, anorexia, increased fluid loss, ulceration. Increased infection susceptibility during immunocompromised time-frame. Moderate to severe loss of lymphocytes. Hair loss after 14 days. 400-500 rads 50% chance of death. 530 to 830 R From 2 hours to two days: moderate to severe nausea and vomiting in 80 to 100 percent of personnel; From 2 hours to six weeks: moderate to severe fatigability and weakness in 90 to 100 percent of personnel. At 10 days to 5 weeks: medical care required for 50 to 100%. At low end of range, death may occur for more than 50% at six weeks. At high end, death may occur for 99% of personnel. Anticipated medical problems include developing pathogenic and opportunistic infections, bleeding, fever, loss of appetite, GI ulcerations, bloody diarrhea, severe fluid and electrolyte shifts, capillary leak, hypotension. Combined with any significant physical trauma, survival rates will approach zero. 550-750 rads Nausia within a few hours ; no survivors. 830 R Plus From 30 minutes to 2 days: severe nausea, vomiting, fatigability, weakness, dizziness, and disorientation; moderate to severe fluid imbalance and headache. Bone marrow total depletion within days. CNS symptoms are predominant higher radiation levels. Few, if any, survivors even with aggressive and immediate medical attention. Greater than 1000 rads Immediate incapacitation and death within a week or less. The response to radiation varies widely amongst people and the longer the time frame over which a specific dose is accumulated the better your body can respond to, and recover from, that radiation damage. In other words, a normally fatal (to 50% of a group exposed to it) cumulative dose of 530 R, if received all within a week or less, would create few noticeable ill-health effects if it was received, but spread out over a years time at the rate of about 10 R per week. That would be less than 1.5 R per day. “Potassium Iodide: ‘KI tablets’, taken a half hour or more before exposure, and then for the next 7-10 days, saturates your thyroid gland with safe stable iodine where if you then later inhale or ingest radioactive iodine your body simply eliminates it. It provides nearly 100% protection from radioiodine and resulting thyroid cell damage and abnormalities, such as loss of thyroid function, nodules in the thyroid, or thyroid cancer. There is a cheap and effective preventative method to protect yourself and family from radioactive iodine. As of January 2005, Iosat, ThyroSafe, and ThyroShield are FDA approved KI products. Safe room: Civil Defense and the Federal Emergency Management Agency recommend a safe room made from duct tape and plastic sheeting. However, the Israeli’s use this method of safe room in conjunction with a protective mask, as the safe room is not trusted to protect against aerosol agents, only liquid droplets. FEMA has neglected this in its recommendations. [Hence you might want to look at ‘gas masks, see: Survival Manual/6. Medical/General Clinic/Protective Equipment. Mr Larry) Even still, this is a minimalist method, and definitely not the best one out there, even when combined with a good protective mask. If you are, however, caught in a crisis situation when a good positive pressure safe room kit is unavailable, this may be your best option. Purchase the thickest plastic sheeting you can buy (6 mil is the thickest usually sold at most hardware stores. ), and the silver looking duct tape, which is the stickiest available. Use pins to hold the plastic sheeting to the wall, then use the duct tape to seal it. Still, you will not be able to achieve an airtight seal, no matter how hard you try, make it the best you can, then don your mask. Evacuation may be another possibility. However, just with radioactive fallout, chemical and biological weapons can shift as easily as the wind. You may be going upwind, but then have it change and blow the cloud of deadly chemical or biological agents right on top of you. Only consider evacuation if you have protective suits and masks, have a place to evacuate to, and have supplies already stored there. Otherwise, stay in place, and take shelter in a safe room or inside a protective mask and suit. Either way, preparations made in advance and supplies pre-positioned, will be essential to assuring success. For instance, Chemical and biological agents can easily contaminate drinking water supplies. Therefore, it is imperative that you keep your water supplies in a tightly sealed container, and decontaminate the outside before opening. It should be noted, that many of the current production NBC protective masks, such as the M-95, have a drinking attachment. The attachment allows you to drink from a special canteen without removing your mask. Check for, and decontaminate if necessary, biological or chemical agents on the canteen’s connection to the mask before use in a contaminated environment. Make sure you keep the canteen top well sealed on the canteen so agents do not leak inside. There are special chemical detection kits that will allow you to detect certain chemical agents in water. The only one available to civilians is the M-272 kit. This kit will detect nerve, blister, and blood agents in water. Bottom Line: Protection against chemical and biological weapons is possible. A safe room is probably the best option, but have quality protective masks and suits available as a backup. Evacuation may not be the best choice, for upwind may just become downwind easily. As mentioned above, this guide was written assuming it would not be read by the majority of its intended audience until a nuclear crisis is already fully upon us–when remaining time and resources to prepare will be extremely limited, maybe with only hours remaining before ‘the music stops’. For that reason, the food, equipment and supplies listed above has been restricted to only the most common and typically available from local resources. If you are fortunate enough to be reading this well before a nuclear threat (or other major disaster) occurs or appears imminent, there’s a great deal more that you can and should do beyond the scope of this brief guide. Surviving the initial threats of a nuclear ‘event’ and radioactive fallout is relatively easy with the proper knowledge and even the most modest of preparations, as we’ve detailed above. The ongoing bigger challenge, though, will be the one brought on by the extensive and much longer-lasting disruptions of services after you survive the nuclear event and emerge safely once the fallout threat has diminished. With more time to research, make plans, and order supplies, families are well advised to acquire more in-depth training, reference books, longer-term food and water stocks, fuel, medical supplies, personal security, communication equipment, radiation monitoring instruments, camping equipment, supplies and tools. Many informative web sites and suppliers make available all of the above, including military MRE’s ready-to-eat meals, dehydrated and freeze-dried foods, as well as buckets of beans, rice, and grains. They also offer solar cookers, water purifiers and barrels, camp and compost toilets, comprehensive medical kits and manuals, shortwave and local two-way radios, perimeter alarms, alternative energy and heating systems, fuel preservatives, long-term packaged seeds, gardening tools, canning equipment, etc. Survivalblog.com has many of the best advertising there. For radiation meters, potassium iodide, etc., see www.ki4u.com. If all of this preparation seems daunting, here’s one strategy to make it a little less overwhelming: Think in two’s. First, acquire all the equipment and supplies your family would need to survive for two weeks if totally cut off from stores and utility and municipal services. It might help to consider all you would need during an extended camping trip in any season. Then, once you’ve accomplished that, expand your preparations and supplies to meet the goal of surviving at home for two months with no utilities or services. After that, continue adding provisions for two more additional months, with the eventual goal of gathering enough supplies so that your family can survive under these distressed conditions for a year or more. A year might seem like overkill, but you’ll no doubt discover that in any disruptive event, numerous friends, neighbors, and relatives will be in need and you will want to help them if you can. Of course, ideally, they should also be preparing their own families for surviving coming disasters, so sharing this information with them might help get them started. Also, for your own family’s security, you always want to try to surround yourself with a buffer of like-minded people who are also doing the right things to prepare so they will become helpful allies instead of only a drain on your limited resources. Reality is, they could possibly even become an outright threat for your family retaining enough supplies for the full duration if difficult circumstances were to drag on and became ever more desperate. Everyone that ‘prepares’ will be one less family standing in line for hours (or days) ahead of others who failed to, awaiting a hoped for arrival of a FEMA handout of food or water. Being prepared makes a ton of sense and will one day soon be seen by all, many painfully, perhaps even fatally, as clearly obvious and self-evident. If you’re trying to convince yourself or a spouse to make the investment in prep equipment and supplies, also keep in mind this fact: Many of the supplies save money because buying in bulk and stocking up now is less expensive than buying smaller quantities later, especially as inflation ramps up and/or shortages appear. Further, if nothing bad ever happens, you can eventually eat the food and use most of the supplies, like toilet paper, fuel, etc., so they won’t go to waste. Job loss — Having two to four months of food at home would certainly relieve much of the stress of losing your job and being without an income while looking for another. Pandemic — We could someday see a pandemic unleashed that would require families to self-quarantine themselves at home for many weeks to avoid catching the disease. Having these supplies and having made these preparations would make that extremely difficult time more endurable. Natural disasters, economic dislocations, civil disruptions — Your family could ride out any number, or cascading combination, of these events in much better shape if you are sufficiently prepared. If you’d like to see a the area of thermal damage caused by a nuclear explosion shown on a street or satellite map, for any location in the USA, go to: <http://www.carloslabs.com/node/16> select your city and state, then from the drop down list, select the weapon’s size, press the “Nuke It” button and you have it. “On last night’s radio show, I outlined the absolute worst case scenario for America should the threats, which we must pray are hollow, of Al Qaeda and the Wikileaks information turn out to become reality. The twist is that instead of thinking “inside the box” I adopted the strategy that our nation’s war gaming community and others would and decided to identify the logical location inside the United States which would benefit one group of nations and enable the Al Qaeda terrorist movement to receive a virtually unlimited amount of funding which could allow them to parallel other Islamist organizations like Hezbollah and Hamas in their civilian and military dual purpose roles within Arab societies. The first thing to consider is the dangerous situation the United States and West now find themselves in. Killing Osama Bin Laden (OBL) was a necessity and as he apparently served little more than a figurehead role in recent years, that position still gave him great weight with the most radical extremists within the Islamist community. The other aspect which should give one pause is the failure of European and American governments to seriously secure the borders of their nations and accepting the open border policy as a solution to promote understanding and world peace, a long time goal of globalists and internationalists since the emergence of Marxism in the 19th century. This combination creates the formula for accessibility any radicalized terror cell would need to infiltrate and create another serious incident, perhaps one thousand times worse than the September 11, 2001 attacks. The information gleaned from the Guantanamo Bay detainees also may indicate a cause for alarm if Al Qaeda has the existing capacity they are reported to have. From the U.K. Telegraph on April 25, 2011 article titled Wikileaks: Guantanamo Bay terrorist secrets revealed: Al-Qaeda terrorists have threatened to unleash a “nuclear hellstorm” on the West if Osama Bin Laden is caught or assassinated, according to documents to be released by the WikiLeaks website, which contain details of the interrogations of more than 700 Guantanamo detainees. While the AQ boys have been known to write checks with their mouth that they cannot cash in reality, this is a disconcerting piece of information considering the wide open borders in our nation and the politically correct approach to dealing with terrorism until recently. The assassination of OBL may be the trigger event or signal which gives terrorists in the United States the green light to proceed; that does not necessarily mean just the Islamists either, as the internationalist movement has been looking for that one seminal event which forces the American population to ask for and accept an internationally structured system of finance and governance. The information above might sound like something from an episode of the television series “24” or one of the conspiracy movies but think about the consequences of a nuclear attack on United States soil. If Al Qaeda does possess a functioning warhead or device, odds are it is from the old Russian nuclear arsenal, probably in the 10 kt to 25 kt range from the tactical warhead stockpile. In a worst case scenario it could even be a 100 kt or larger device from the Russian ICBM arsenal, yet it is highly unlikely that such a device would escape the Russian Republic, even during the confusion of the 1990′s. Unfortunately, like it or not, this gives the AQ threat a little bit more credence as even the Russians continue to refuse to acknowledge the numbers of nonstrategic weapons in their arsenal nor provide an inventory for review. This blind spot in the various nuclear weapons treaties is countered by the Russian argument that there is nothing to worry about as they have closed all storage facilities across their nation and consolidated all of the warheads in one central location. By using deductive reasoning is it not a major reach nor requirement to develop an extravagant conspiracy theory to assume that it is possible that one or more of the nuclear devices have escaped their oversight and control. That begs the question then; if Al Qaeda has studied the various documents about nuclear attack scenarios on U.S. soil provided by FEMA, the Department of Defense, and other agencies over the years, what location would cripple America for decades and kill our nation in thirty seconds or less? Note the location, as the terrorists already have, of our petrochemical, refining, and other oil facilities in the Houston area. A detonation in the Deer Park area just southeast of the city destroying several large refineries, storage facilities, and natural gas electrical generation sites. The problem after the initial explosion beyond the immediate fatalities, panic initiated in one of America’s largest cities, contamination, and destruction of infrastructure is the spread of radioactive debris or fallout. An important difference between a surface burst and an air burst is, consequently, that in the surface burst the radioactive cloud is much more heavily loaded with debris. This consists of particles ranging in size from the very small ones produced by condensation as the fireball cools to the much larger debris particles which have been raised by the afterwinds. The exact composition of the cloud will, of course, depend on the nature of the surface materials and the extent of their contact with the fireball. I created the inset map to highlight the regions that would be impacted the greatest by a nuclear event in the Houston, Texas energy complex region. The fallout from a surface explosion based on the prevailing winds in the early autumn assuming a cold front is dropping from the north. The contamination for a small device would not be as widespread as the map displays but the terror to civilians would be palpable and create massive refugee flows away from coastal regions in the projected impact zones. Unfortunately the areas most likely areas to receive a measurable threat from a sub 100 kiloton detonation would be more of the primary oil production and processing facilities from Beaumont, TX and coastal platforms through southern Louisiana, again depending on the upper level wind patterns at that time. Thus not only would a sizable percentage of our refining capacity be impacted directly in the blast zone, other areas would be temporarily unusable until the radiation levels decreased sufficiently for clean up and civilians were assured that they could work in those areas safely and returned. This type of attack would remove close to thirty percent of our refining capacity not to mention an emergency evacuation of our platforms off the coast of that region, the shutting down of one of our most important military and commercial seaports, and the cessation of a large percentage of the oil and gas via pipelines originating from this region into the Midwest, Northeast, and South regions of the country. The United States economy would fall immediately into a depression, the dollar would collapse overnight, rationing of energy and foodstuffs would become a fact of life, and large quantities of our troops overseas would have to be recalled home to help maintain law and order. That begs the question, beyond Al Qaeda getting their “headline” and alleged revenge for the destruction of their leadership, who are the big winners? Those nations either have strategic benefits extracted from the conversion of the U.S. from a superpower into a second world state or the much-needed boost into becoming an economic superpower. Russia would enjoy a renaissance as they would own Europe as a colony with the energy dependency they would gain as the American power vacuum expands instantly. China would achieve a strategic advantage over the Pacific and East Asian region as America would be economically incapable of stopping any actions they desired to engage in. Indonesia and Iran would instantly have the energy card to play and shift the OPEC dynamic from a consideration for the destabilized Arab states to a new cartel based on Venezuela, Iran, Indonesia, Nigeria, Angola, and other nations not experiencing domestic instability and dependent on the U.S. for their security needs. Thus one has to consider the economic benefits for promising Al Qaeda billions of dollars in gold or other financing to execute such an attack from some of the nations listed above. It would also give AQ the necessary funding so their organization could expand into programs similar to the infrastructure and political programs developed by Hezbollah and Hamas, and allow them to engage in activities in Arab nations which were allied with the U.S. as an ally or adjunct to groups like the Muslim Brotherhood, their old allies. The biggest loser besides the U.S. would unfortunately be the nation of Mexico, already in the throes of domestic instability with a narco-terrorist war approaching the level of an internal civil conflict. The illegal and legal resident aliens would probably flee the U.S. as the border would instantly be militarized after such an event. With millions of unemployed citizens returning home plus the loss of one of Mexico’s largest crude oil customers (why would we buy oil we can’t process; remember that fact) the formula for a massive civil war to develop would be in place, putting further stress on our nation. One shot like this one and the United States is off of the geopolitical stage in less than thirty seconds. These facts are nothing new to the terrorists nor those within the national security apparatus in Washington, D.C. or elsewhere. The government began taking measures to improve security and monitoring of these facilities and regions several years ago based on threats received from intelligence overseas and they have made no secret of their acknowledgment of the importance of these areas in our country. Unfortunately a nuclear device in a rental or stolen box truck with a suicide bomber at the wheel driving on the Pasadena Expressway or the Beltway would be unstoppable once the weapon is armed and he or she is on the road filled with evil intent. B. Where are the potential targets for nuclear attacks? • Strategic missile sites and military bases. • Centers of government such as Washington, DC, and state capitals. • Important transportation and communication centers. • Manufacturing, industrial, technology, and financial centers. • Petroleum refineries, electrical power plants, and chemical plants. • Major ports and airfields. • Large cities such as NY, Boston, Washington, Atlanta, L. A., Dallas, Houston, Portland, Charlotte, Denver, etc. • Symbolic American cities such as Philadelphia, Hollywood, or Orlando (Disney Land). • Heartland cities such as St. Louis, Memphis, Chicago. • Cities or locations on the West Coast (taking advantage of maximum casualties created through east-traveling fallout). • Major sporting event such as Super Bowl or other sports game. Unlike the Cold War era when we would have some warning of an attack, in today’s world where the greatest possibility of a nuclear explosion will be delivered via terrorists, you will not receive notice of an impending attack. The unfortunate souls who are vaporized by a terrorist’s nuclear blast would probably be reserved to an area 1 mile in diameter. The blast wave will move out so fast that people within 5 miles won’t have time to escape unscathed. Those located 5 to 20 miles from the blast will probably see the mushroom cloud or panicking people and be able to make a hasty entrance into an underground bomb shelter in time to escape fallout hazards. Many baby boomers (people in their 50s) will race to local fallout shelters once maintained by the Civil Defense plan but no longer stocked with supplies. They are the ones who grew up doing monthly “duck and cover” drills in elementary or junior high school. The decision will improve their chances of receiving less radiation than most. But, many will die. Within half an hour, most Americans will probably know a nuclear strike has taken place, and when and where it happened. Fallout charts will pepper the news and warn people in the predicted area. Those of us who have built a shelter will have ample time to secure ourselves within the shelter. Everyone else within the expected fallout zone will frantically pack their bags and hit the road in hopes of escaping the fallout, which will be falling 50 miles from ground zero an hour after the explosion. The traffic jams will see large numbers of people exposed to the radiation within the fallout. Those poor souls will be dead within hours. Some people within the traffic jams will escape with their lives by heading in a direction perpendicular to the expected fallout zone. C. What to do if a nuclear disaster is imminent! This guide is for families preparing for imminent terrorist or strategic nuclear attacks with expected blast destruction followed by widespread radioactive downwind fallout. IF ONLY A ‘Dirty Bomb’ Attack (Not the vastly more devastating nuclear weapon blasts with fallout discussed below.) – You can expect localized and downwind contamination from the explosion and dispersed radioactive materials. If you are near enough to see or hear any local bomb blast, assume that it includes radiological or chemical agents. You should move away from the blast area as quickly as possible. If the wind is blowing toward you from the direction of the blast, travel in a direction that is crosswise or perpendicular to the wind as you move away from the blast area. If possible cover your face with a dust mask or cloth to avoid inhaling potentially radioactive dust. Upon reaching a safe location, remove your outer clothing outside and shower as soon as possible. Refer to local news sources for additional instructions about sheltering or evacuation. The government is better prepared to direct and assist the public in ‘dirty bomb’ emergencies, unlike more serious nuclear weapon attacks below. In a national crisis of imminent nuclear weapon attacks, read all the way through this guide first, THEN TAKE EFFECTIVE PROTECTIVE ACTION, WITH CONFIDENCE… FAST! If you are considering evacuation, your decision requires very high confidence that it is worth the risk. You do not want to get stuck between your current location and your hoped for destination, as there will probably be no easy getting back. If you fail to get to your destination, you may be exposed without shelter, in a dangerous situation with little effective law enforcement, perhaps among panicked hordes of refugees. Whatever supplies you have may be limited then to what you can carry on foot. IF you are in a big city or near a military target, AND you have relatives or friends in the country that you know are awaiting you, AND the roads between you and them are clear, AND the authorities are not yet restricting traffic, AND you have the means and fuel, evacuation may be a viable option for a limited time. DO NOT attempt evacuation if all of the above is not clearly known, or if the situation is deteriorating too quickly to assure the complete trip. You do not want to get stuck and/or become a refugee being herded along with panicked masses. 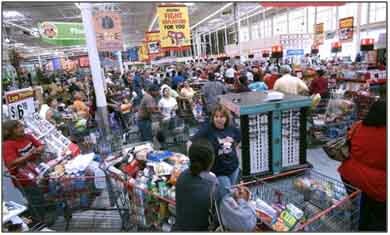 If evacuation is truly a viable option, do not wait – GO NOW! Do so with as many of the supplies listed in #7 as possible. Better to be two days too early in arriving than two hours too late and getting snagged mid-way, potentially exposing your family to a worse fate than having stayed where you were. Because of the very real danger of getting caught in an evacuation stampede that stalls, almost all families will be better off making the best of it wherever they currently are. Because time is of the essence, you need to first delegate and assign to different adult family members specific tasks so they can all be accomplished at the same time. Your first priorities to assure your family survival are: Shelter, Water, and Food/Supplies. While some are working on the water storage and shelter at home, others need to be acquiring, as much as possible of the food and supplies. Because much of the food and supplies listed at #7 of this guide may quickly become unavailable, you need to assign someone NOW to immediately go to the stores with that list! Get cash from the bank and ATM’s first, if it can be done quickly, but try to use credit cards at the stores, if at all possible, to preserve your cash. With one or more adults now heading to the stores with the list at #7, those remaining need to begin storing water IMMEDIATELY! Lack of clean water will devastate your family much more quickly and more severely than any lack of food. Without clean water for both drinking and continued good sanitary practices in food preparation and for bathroom excursions (which could be much less sanitary than normal), debilitating sickness could rampage through your family with little hope of prompt medical attention. That is a likely but, avoidable, disaster, ONLY IF you have enough water. Every possible container needs to be filled with water RIGHT NOW! It will be very hard to have stored too much water. When the electricity/pumps go down or everybody in your community is doing the same thing, thus dropping the water pressure, what you’ve got is all you might be getting for a very long time. Empty pop bottles (1-3 liter) are ideal for water storage, also filling up the bathtub and washing machine. (Remember, later you’ll have some in your hot water tank.) If you have any kiddie pools or old water beds, pull them out and fill them up, too. (Water from a water-bed should be used only for bathing or cleaning, not for drinking as it may contain traces of algaecide and/or fungicides.) Anything and everything that’ll hold water needs to be filled up quickly RIGHT NOW!! One of the shopping items listed at #7 is new metal garbage cans and liner bags which you’ll also use for storing water. If you can’t get any more new cans, you could clean out an existing garbage can and scrub it throughout with bleach, then put in a new garbage bag liner and fill it with water. Even sturdy boxes could be used with bag liners. (Use two liners if they are very thin/flimsy.) Choose well where you fill up garbage cans with water because they won’t easily be moved once full and many of them together could be too heavy for some upper floor locations. Ideally, they need to be very near where your shelter will be constructed and can actually add to its shielding properties, as you’ll see below. BE ASSURED, YOU CANNOT STORE AND HAVE TOO MUCH WATER! Do not hesitate, fill up every possible container, RIGHT NOW! The principles of radiation protection are simple – with many options and resources families can use to prepare or improvise a very effective shelter. You must throw off any self-defeating myths of nuclear un-survivability that may needlessly paralyze and panic and then seal the fate of, less informed families. Radioactive fallout is the particulate matter (dust) produced by a nuclear explosion and carried high up into the air by the mushroom cloud. It drifts on the wind and most of it settles back to earth downwind of the explosion. The heaviest, most dangerous, and most noticeable fallout, will ‘fall out’ first closer to ground zero. It may begin arriving minutes after an explosion. The smaller and lighter dust-like particles will typically be arriving hours later, as they drift much farther downwind, often for hundreds of miles. Once it arrives, whether visible or not, all that will fall will have done so usually in under an hour, then blow around everywhere just like dust does on the ground and roofs. However, rain can concentrate the fallout into localized ‘hot spots’ of much more intense radiation with no visible indication. This radioactive fallout ‘dust’ is dangerous because it is emitting penetrating radiation energy (similar to x-ray’s). This radiation (not the fallout dust) can go right through walls, roofs and protective clothing. Even if you manage not to inhale or ingest the dust, and keep it off your skin, hair, and clothes, and even if none gets inside your house, the radiation penetrating your home is still extremely dangerous, and can injure or kill you inside. Radioactive fallout from a nuclear explosion, though very dangerous initially, loses its intensity quickly because it is giving off so much energy. For example, fallout emitting gamma ray radiation at a rate over 500 R/hr (fatal with one hour of exposure) shortly after an explosion, weakens to only 1/10th as strong 7 hours later. Two days later, it’s only 1/100th as strong, or as deadly, as it was initially. What stops radiation, and thus shields your family, is simply putting mass between them and the radiation source. Like police body armor stopping bullets, mass stops (absorbs) radiation. The thicker and heavier the mass, the more radiation it stops, and the more effective it is with every inch more you add to your fallout shelter. The thickness in inches needed to cut the radiation down to only 1/10th of its initial intensity for different common materials is: Steel 3.3″, concrete 11″, earth 16″, water 24″, wood 38″. The thickness required to stop 99% of the radiation is: 5″ of steel, 16″ of solid brick or hollow concrete blocks filled with mortar or sand, 2 feet of packed earth or 3 feet if loose, 3 feet of water. (BTW, lead is nothing special, same as anything else pound for pound.) You may not have enough steel available, but anything you do have will have mass and can be used to add to your shielding – it just takes more thickness of lighter wood, for example, than heavier earth, to absorb and stop the same amount of radiation. Increasing the distance between your family inside and the radiation outside also reduces the radiation intensity. • To maximize the distance away from the fallout ‘dusting’ outside on the ground, roof and trees. While a fallout shelter can be built anywhere, you should see what your best options are at home or nearby. Many structures already provide significant shielding or partial shielding that can be enhanced for adequate protection. If you do not have a basement available, you can still use the techniques shown below in any above ground structure, you’ll just need more mass to achieve the same level of shielding. You may consider using other solid structures nearby, especially those with below ground spaces, such as commercial buildings, schools, churches, below ground parking garages, large and long culverts, tunnels, etc.. Some of these may require permissions and/or the acquiring of additional materials to minimize any fallout drifting or blowing into them, if open ended. Buildings with a half-dozen or more floors, where there is not a concern of blast damage, may provide good radiation protection in the center of the middle floors. This is because of both the distance and the shielding the multiple floors provide from the fallout on the ground and roof. For an expedient last-minute basement shelter, push a heavy table that you can get under into the corner that has the soil highest on the outside. The ground level outside ideally needs to be above the top of the table shelter inside. If no heavy table is available, you can take internal doors off their hinges and lay them on supports to create your ‘table’. Then pile any available mass atop and around the other two open sides such as books, wood, cord wood, bricks, sandbags, heavy appliances, full file cabinets, full water containers, your food stocks, even boxes and pillow cases full of anything heavy, like earth. Everything you can pile up and around it has mass that will help absorb and stop more radiation from penetrating inside – the heavier the better. However, be sure to reinforce your table and supports so you do not overload it and risk collapse. An effective fallout shelter constructed in a basement may reduce your radiation exposure 100-200+ fold. Thus, if the initial radiation intensity outside was 500 R/hr (fatal in one hour), the basement shelter occupants might only experience 5 R/hr or even less, which is survivable, as the radiation intensity will be decreasing with every passing hour. Adding mass on the floor above your chosen basement corner, and outside against the walls opposite your shelter, will also increase your shielding protection. Every inch thicker adds up to more effective life-saving radiation shielding. It’s really not so difficult to build an effective family fallout shelter, not to get it completed… RIGHT NOW! If you’ve accomplished the above; securing your supplies, stored water, and built your family fallout shelter, CONGRATULATIONS! You have now succeeded in improving the odds of survival for your family a 100-fold, or more! Now, you need to expand your knowledge and fine-tune the tactics that will make the most of your family survival strategy. .
_a) If you are close to a target, your first indication of a nuclear detonation may be with its characteristic blinding bright flash. The first effects you may have to deal with before radioactive fallout arrives, depending on your proximity to it, are blast and thermal energy. Promptly employing the old “Duck & Cover” strategy, immediately upon the first indication of the flash, will save many from avoidable flying debris injuries and minimize thermal burns. Those very close will soon experience tornado strength winds and should quickly dive behind or under any solid object, away from or below windows. Even in the open, laying flat, reduces by eight fold the odds of being hit by any debris. A very large 500 kiloton blast, 2.2 miles away, will arrive about 8 seconds after the detonation flash with a very strong three-second wind blast. That delay is even greater further away. That is a lot of time to duck & cover IF alert and you should stay down for 2 minutes. If not near any target ‘ground zero’ you will only, like the vast majority, have to deal with the fallout later. _b) Government information and guidance is a vital resource in your response to a nuclear crisis, but for many reasons it may be late, incomplete, misleading or simply in error. While evacuation might be prudent for individuals who act quickly in response to a threat, governments will be slow to call for mass evacuations before an event because of their potential for panic and gridlock. As the past government calls for duct tape and plastic sheeting led to sold-out stores, anxiety, and derision from the press, there will be great reluctance to issue similar alarms. 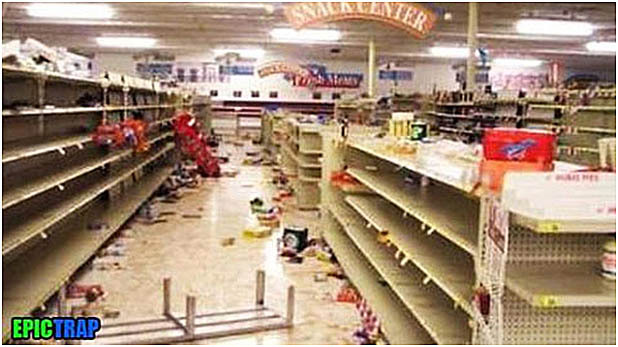 If you want to assure that you have adequate food and supplies for your family you must act BEFORE the panic without first waiting for government instructions that may never come or as urgently as warranted. You alone are ultimately responsible for your family. _c) Filtering the air coming into your home shelter won’t be required. Air does not become radioactive, and if your home is reasonably tight, there won’t be any wind blowing through it to carry the radioactive fallout dust inside. Simply sealing any windows and other openings prevents significant fallout from getting inside. To improve both the radiation shielding inside and to protect the windows from being broken and letting fallout blow in later, you should cover them all with wood, and basement windows with boards and earth, sandbags or solid masonry blocks, etc. on the outside and inside too, if possible. If the basement air gets seriously stale later on, you could re-open a door into the upper floors of the still closed house, or secure a common furnace air filter over an outside air opening leading into your basement. _d) Regarding fallout contamination, any food or water stored in sealed containers, that can later have any fallout dust brushed or rinsed off the outside of the container, will then be safe to use. As long as the fallout dust does not get inside the container, then whatever radiation penetrated the food/water container from the outside does not harm the contents. If you suspect that your clothes have fallout on them, remove your outer clothing before you come inside and leave them outside. A cheap plastic hooded rain poncho that can be easily rinsed off or left outside is very effective. Have water and baby shampoo near the entrance to wash and thoroughly rinse any exposed skin and hair. Exposure to fallout radiation does not make you radioactive, but you need to assure that you don’t bring any inside. If any are stricken with radiation sickness, typically nausea, it is when mild, 100% recoverable and cannot be passed on to others. Before fallout arrives, you might also try to cover up items you want to protect outside for easier rinsing off of the fallout dust later when it’s safe to come out and do so. For instance, if you have a vegetable gardening spot or cord wood for heating, you might try covering some of it with plastic or tarp and weighting them down. _e) If without sufficient time to acquire radiological instruments of your own, like survey meters, Geiger counters and dosimeters, you’ll need to be extra sure that your portable radios function properly from inside your shelter and that you have plenty of fresh batteries stocked for them. Without radiological instruments, listening for official guidance about the radiation threat levels in your particular area will be the only way you’ll know when it’s becoming safe to venture out. It might also be the only way you’ll know when you first need to take your initial maximum protective action. When not in use, emergency radios should not be attached to any outside antenna or even have their own antenna extended. And, they should be wrapped in any non-conducting insulation, like layers of paper or bubble wrap plastic and then stored in a metal container or wrapped in aluminum foil to minimize the potential of EMP ruining the electronics. Having back-up radios would be very prudent. With extra radios, you can have one always tuned to the closest likely target city and, if it suddenly goes off the air, that could be your first indication of an attack. _f) When fallout is first anticipated, but has not yet arrived, anyone not already sheltered should begin using their N95 particulate respirator masks and hooded rain ponchos. Everyone should begin taking Potassium Iodide (KI) or Potassium Iodate (KIO3) tablets for thyroid protection against cancer causing radioactive iodine, a major product of nuclear weapons explosions. If no tablets available, you can topically (on the skin) apply an iodine solution, like tincture of iodine or Betadine, for a similar protective effect. (WARNING: Iodine solutions are NEVER to be ingested or swallowed.) For adults, paint 8 ml of a 2 percent tincture of Iodine on the abdomen or forearm each day, ideally at least 2 hours prior to possible exposure. For children 3 to 18, but under 150 pounds, only half that amount painted on daily, or 4 ml. For children under 3 but older than a month, half again, or 2 ml. For newborns to 1 month old, half it again, or just 1 ml. (One measuring teaspoon is about 5 ml, if you don’t have a medicine dropper graduated in ml.) If your iodine is stronger than 2%, reduce the dosage accordingly. Absorption through the skin is not as reliable a dosing method as using the tablets, but tests show that it will still be very effective for most. Do not use if allergic to iodine. If at all possible, inquire of your doctor NOW if there is any reason why anybody in your household should not use KI or KIO3 tablets, or iodine solutions on their skin, in a future nuclear emergency, just to be sure. _g) When you know that the time to take protective action is approaching, turn off all the utilities into the house, check that everything is sealed up and locked down, and head for the shelter. You should also check that you have near your shelter additional tools, crow bars, and car jacks for digging out later, if required, and fire extinguishers handy, too. Also, any building supplies, tools, sheet plastic, staple guns, etc. for sealing any holes from damage. Your basement should already be very well sealed against fallout drifting inside. Now, you’ll need to seal around the last door you use to enter with duct tape all around the edges, especially if it’s a direct to the outside door. _h) You don’t need to risk fire, burns, and asphyxiation trying to cook anything in the cramped shelter space, if you have pre-positioned in your shelter enough canned goods, can opener, and other non-perishable foods, that are ready-to-eat without preparation. More food, along with water, can be located right outside your crawl space entrance that you can pull in quickly as needed when safe to do so. _i) For lighting needs within the shelter have some small LED flashlights or LED head-lamps to stretch your battery life. Try not to have to use candles if at all possible. Bring in some books for yourself and games for the children. Throw in a small/thin mattress, some cushions, blankets, pillows, etc. _j) Toilet use will be via a portable camp toilet or a 5 gallon bucket with a seat borrowed from one of the house bathrooms, if you did not purchase a separate one. Garbage bag liners, preferably sized for it, should always be used and a full-size and bag lined garbage can should be positioned very close outside the shelter entrance for depositing these in when it is safe to do so quickly. Hanging a sheet or blanket will help provide a little privacy as shelter occupants ‘take their turn’. The toilet needs to have its new ‘deposits’ sealed up tight with the plastic liner after each use and hand sanitizer towelettes nearby. Use a very secure top on the bucket and position it near the wall entrance with the outgoing upper air vent. _k) Pets, and what to do about them, is a tough call if you fail to make provisions for them. Letting pets run free is not a humane option, both for their potential to die a miserable death from radiation exposure outside and/or to be a danger to others, especially with dogs running in the inevitable packs of multitudes of others abandoned. Preparing for them is ideal, if truly realistic and not a drain on limited resources, while ‘putting them down’ might eventually become a painful, but necessary reality if the disruption of food supplies becomes very long-term. _l) Boiling or bleach water treatments will be used for cleaning questionable water later for drinking. (This is for killing bacteria, not for radiation contamination, which is never a concern for any stored and covered water containers or even sealed food.) Tap water recently put into clean containers won’t likely need to be purified before using. To purify questionable water, bring it to a rolling boil and keep it there for 1 minute. If you don’t have the fuel to boil it, you can kill the bacteria by mixing in a good quality household bleach at the rate of 10 drops per gallon, and letting it sit for at least 1/2 an hour. The bleach should be at least 5.25% pure, like regular, Clorox, be sure it has no additives such as soap or fragrance. You can later get rid of the flat taste from boiling, or some of the chlorine taste when using bleach, by pouring it from one container to another several times. as a WMD. Derived from the beans of the castor plant (Ricinus communis), Ricin is native to Africa and common in warm climates worldwide. More than 1 million tons of castor beans are processed every year worldwide. It is easily and inexpensively produced, is highly toxic, and is stable in aerosolized form. Ricin has no treatment or vaccine, but it is not communicable from person to person. Although a large amount of ricin would be necessary to produce many casualties, it would be highly effective within a closed environment. Ricin can be disseminated as an aerosol, by injection, or as a food and water contaminant. Its use as a food and water contaminant is a major concern. If ricin were used in that fashion, resultant deaths could overwhelm local health care resources. Ricin is a protein derived from the beans of the castor plant (R communis). Castor beans are used in the production of castor oil, a brake and hydraulic fluid constituent. Ricin makes up 3-5% of the “waste mash” that is produced during this process. Separating out this protein is not difficult; it only requires chromatography, a common undergraduate chemistry skill. Symptoms from exposure to ricin depend on the route of exposure and the amount of absorption. Routes of exposure are respiratory (inhaled aerosol), gastrointestinal (GI [ingested]), and percutaneous (injected). If exposed to ricin through inhaled aerosol, it will most likely affect numerous individuals simultaneously. In this case, a cluster of people would develop similar symptoms over a brief period, typically within 8 hours following inhalation. Such an occurrence would point to the possibility of an intentional act. People exposed to the ricin may experience symptoms such as fever, nausea and vomiting, a progressively severe cough, and congestion in the nose and the throat. Other symptoms associated with inhalation of ricin include difficulty breathing and tightness in the chest. With significant exposure to ricin, breathing difficulties occur within 12-24 hours. A chest x-ray may reveal excess fluid in the lungs. If exposed to ricin by ingesting contaminated foods or beverages, symptoms may initially mimic food poisoning, usually within 6 hours after ingestion. People who ingested ricin may feel abdominal pain, often accompanied by vomiting and diarrhea. Because of this, they may also become dehydrated. Although ingesting ricin is usually less toxic than exposure through inhalation, with significant amounts of the poison, resulting symptoms may become more severe and possibly result in death. A person exposed to ricin should seek medical attention as soon as possible. immediately leave that area and move to an area with fresh air. them regarding appropriate evacuation procedures. In an aerosol attack, people should use protective masks that are effective in preventing toxicity. clothing and thoroughly wash their skin with copious amounts of soap and water. If their eyes are irritated, people must wash them out with water. No antidote or vaccine is available for ricin. Regardless of the route of exposure, treatment remains mainly supportive. If exposure is from inhaled aerosol, the person may need assistance with breathing. If particularly severe, the person who was exposed may require intubation and use of a ventilator. If ricin was ingested, the stomach may need to be pumped (called gastric decontamination). Superactivated charcoal may also be given to help soak up the poison. To treat dehydration, intravenous fluids may be given. Antibiotics serve no role in the treatment of ricin poisoning. Medications may be given to treat seizures and low blood pressure that are sometimes associated with exposure to ricin. In the case of ricin exposure by injection, antibiotics may serve to prevent infection. A tetanus immunization may also be given as a precautionary measure. The only effective prevention against a biological attack with ricin is avoidance; unfortunately, no antidote or vaccine exists. Currently, investigations are ongoing for possible vaccines and ricin inhibitors. Protective masks have been shown to be effective in preventing toxicity during an aerosol attack.